Adidas is a German sports equipment manufacturer and was founded in 1949. The company has it´s headquarter in Herzogenaurach and has currently about 53.700 employees. Since 1995 Adidas is listed in the DAX on the Frankfurt Stock Exchange and currently the corporation has a market capitalization of 14,7 billion euros. With a weight of just 1,58% the company is one of the smaller companies that are listed in the DAX. Right now Adidas is behind Nike the world largest sportswear manufacturer. 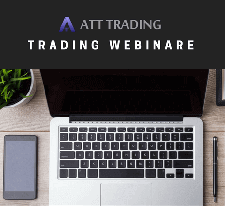 In this fundamental analysis we will first look at the key financial ratios and will analyze how the company has developed over the last years. Then we will compare Adidas with Nike and we will also look at the different regions where Adidas is generating most of it´s revenue. 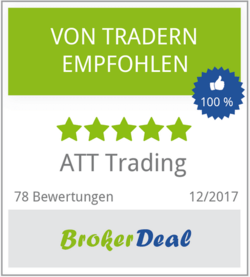 Finally we will summarize the main points of this analysis with the help of a SWOT-Analysis and we are also going to give a medium- and long-term outlook for the stock. Over the last 8 years Adidas improved it´s revenue from 10.3 billion euro up to 14.5 billion euro, which represents a growth of 40%. But over the last 3 years the sales clearly stagnated and the company generated last year 2% less revenue than in 2012. 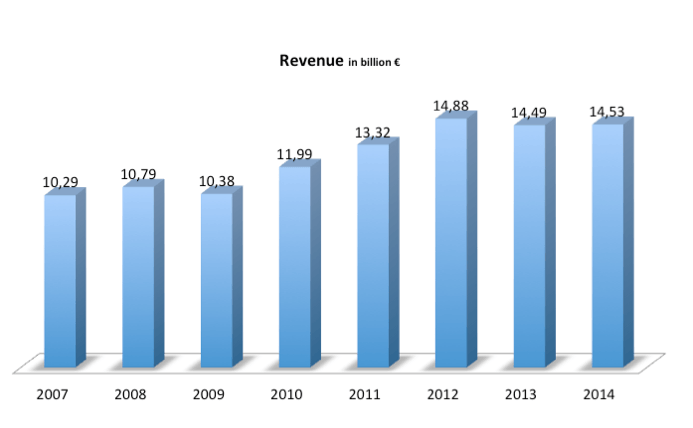 In the picture above we can see that the revenue of Adidas not only stagnated over the last 3 years but also during the years 2007-2009. 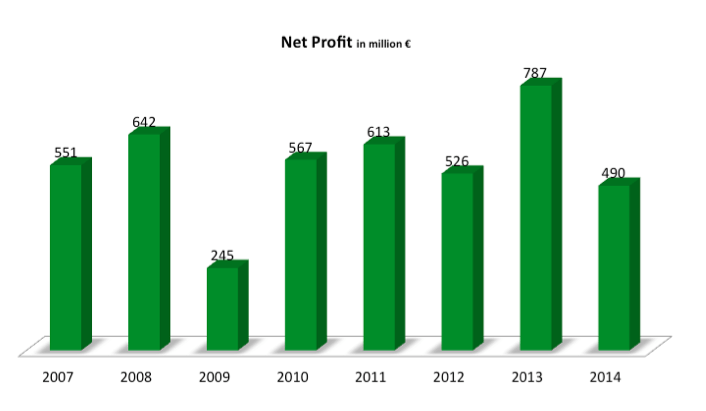 The net profit is stagnating over the last 8 years and only in 2013, Adidas was able to convince with a significant higher profit of almost 800 million euro. During the presentation of the latest earnings, the CEO of Adidas, Herbert Hainer, said that revenues are stagnating due to currency fluctuation in key international markets such as Russia and Argentina. At the same time the Golf division and the US sales are showing some weakness. In 2014 the sales in the US decreased by 7%. Currently Adidas has a price-earnings-ratio of 24, which is quit high, because the average price-earnings-ratio of all DAX companies is currently 16. When it comes to work out how profitable a company is, investors are always looking at the return on equity, because at the end all investors want to invest only in profitable companies. In 2014 Adidas had a return on equity of 8.7% and this ratio is also not very convincing, because the average return on equity of all DAX companies was over 10% in 2014. At the same time the ROE of Adidas decreased 30% over the last 5 years. Even more badly is the developing over the last 8 years because in 2007 Adidas was able to generate a very strong ROE of 18%. 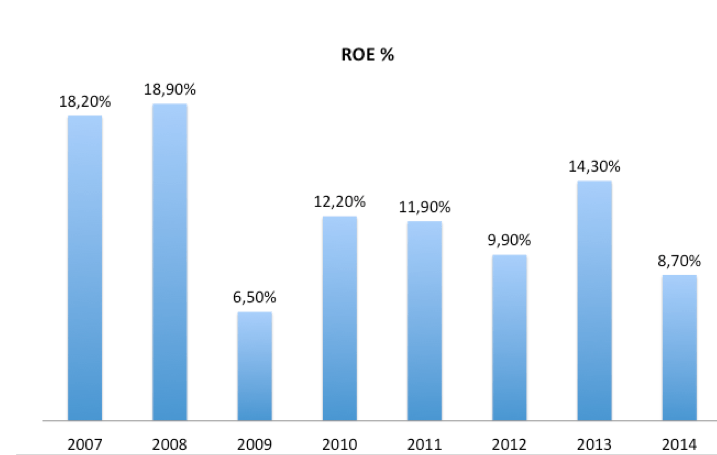 If you look at the ROE you should also look at the equity ratio to find out how stable the financial situation of the company is and how large the leverage is. Right now Adidas has an equity ratio of 45% which is quit high, because the average equity ratio of all DAX companies is just 29%. The corporation was able to maintain this high equity ratio between 43%-47% over the last 5 years. The equity ratio is a very important key figure, but investors have usually different opinions on it. One the one hand a company needs a very solid equity ratio to maintain a good financial stability during a recession, but one the other hand the equity ratio should not be to high, because it ́s not so easy for a company to generate a good return on equity with a high equity ratio. Currently shareholders of Adidas are looking forward to get a dividend yield of 2,1% which is exactly the average of all DAX companies. It is positive that the corporation increased the dividend from 0.5 € to 1.5 € per share over the last 8 years, but it is very doubtful whether this trend is going to continue because we have already seen that both sales and profits are stagnating. The Adidas stock has improved by 80% over the last 5 years, which is a little bit weaker than the DAX, which increased over 90% during that time. However the development of the stock during this time should be a clear alert signal, because until summer 2014 Adidas was a outperformer in the DAX and increased twice as high as the DAX from the year 2010. Investors had very high expectations on the stock because of the soccer World Cup in 2014, but Adidas was not able to met those expectations and was sold off by the market during the second half of 2014. The key financial figures of Adidas are showing some weakness. On the one hand the sales and profits are stagnating at the moment and on the other hand the company also has a higher price-earnings-ratio (24) than the market (16). Adidas has a very high equity ratio, which gives the company a good financial stability but at the same time the return on equity has been in a down-trend over recent years. The dividend yield is only average and due to stagnating profits the company will not be able to increase the dividend. Adidas is the second largest sports-equipment manufacturer in the world behind Nike, but we have already seen, that Adidas is right now not able to grow. At the same time Nike was able to increase it´s revenue from $18.3 billion up to $27.8 billion over the last 5 years, which represents a growth of 52%. The net profit of Nike also increased by 42% during this period, which makes the view on the financial ratios of Adidas even more worse. Thereby it was Adidas, which had very ambitious goals, because over 5 years ago, the company announced the “Route 2015” where Adidas wanted to increased it´s net profit by 15% every year and wanted to generate revenue of 17 billion euro in 2015. 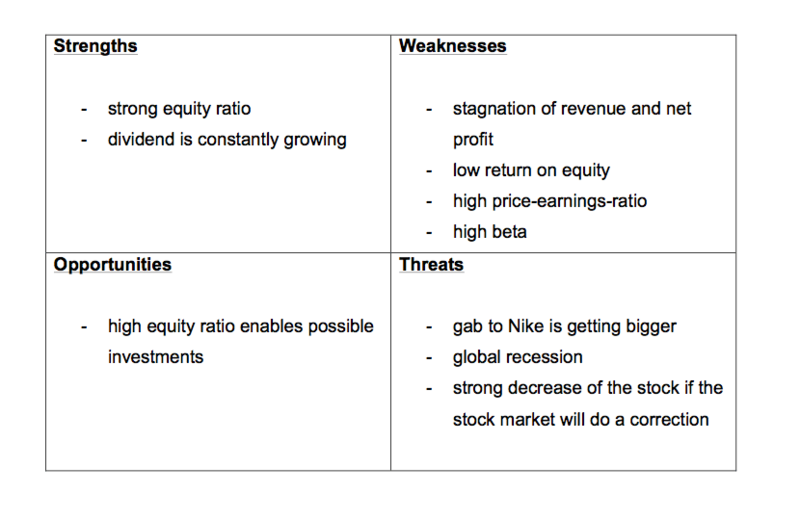 The company missed these goals, instead it´s Nike, which is constantly growing year by year. A significant different between those two companies is the sponsoring: Since many years Nike is able to get the top athletes under contract and is willing to spent a lot of money. Currently Nike has for example athletes like Michael Jordan (Nike Air Jordan), Lebron James, Roger Federer, Rafael Nadal, Tiger Woods and Cristiano Ronaldo under contract. Roger Federer is getting e.g. $130 million for 10 years from Nike. These sponsoring contracts pay off for Nike, due to those very special and famous personalities people are willing to buy the products from Nike. Only with the shoes of Michael Jordan (Nike Air Jordan) Nike generated between $2 and $2.5 billion every year over the last 5 years. When Nike presented a new pair of shoes from Air Jordan last year, the company sold over 480,000 units in just 3 hours and generated $80 million in such a short time. 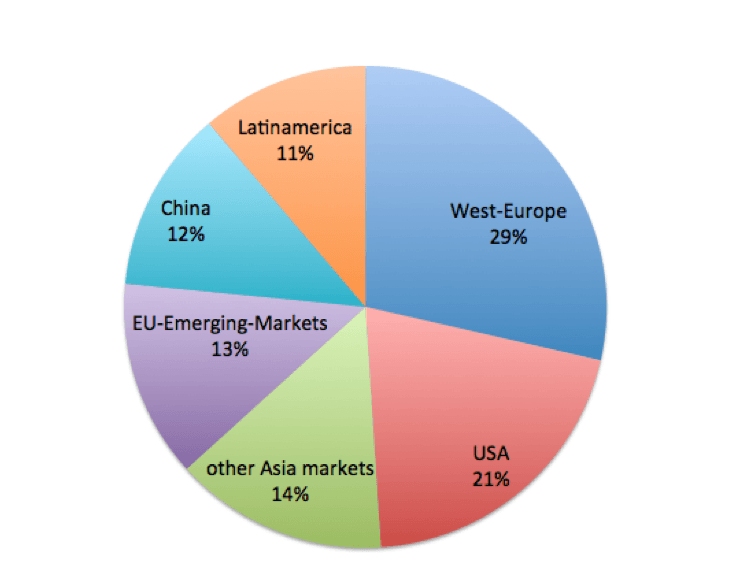 The picture above shows that Europe and the US are the most important markets for Adidas in which the company is generating 50% of it´s revenue. In Europe the company made 29% of it ́s revenue last year. Right now the Eurozone has a lot of problems and the economy has still not recovered from the last recession and the unemployment rate is over 10% At the same time Greece is also a large uncertainty. Therefore and because of the risk of deflation the European Central Bank decided to start with a large quantitative easing program whereby the EZB will buy private and public bonds for more than 1.000 billion euro to bring the European economy back on track. But this is no guarantee that the European economy will get stronger. Currently the economic situation in the US is quit good and can convince in contrast to Europe or Asia. Right now the US economy is growing very strong due to the very good labor market conditions. The US is depending very much on the labor market because it ́s primarily a consumer society and because of that it is very important that a lot of Americans have a constant income. However the US might see the very first rate hike by the Federal Reserve in 7 years and there is legitimate concern that the economy could grow more slowly over the next years. 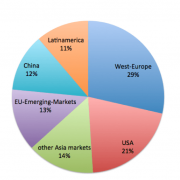 Although China is not the most important market for Adidas, however, still need to get mentioned in a global analysis, as the Chinese economy is probably the most important factor for the global economy. China is growing as slow as over the last 25 years and a lot of investors expect that the Chinese Central Bank will cut interest rates over the next months. Currently the situation on the stock market is not so easy to evaluate, because although there are some question mark in the global economy, a lot of indices are at their all time high and a correction is more than ever likely to happen. However this correction might get happen a little later at some point in the future due to the ECB QE-Program. If the stock market would do a correction, almost every stock would also decrease. That ́s why it is important to find out how much a stock is depending on the market movements. A good financial ratio to find out this is the beta-factor, which indicates the systematic risk of a stock. This ratio shows how volatile a certain stock behaves in comparison to the overall market. If the market makes a movement of 20% and one certain stock also moves 20%, this stock has a beta-factor of 1. If this stock would have made a 30% movement, the beta-factor would be 1,5. Over the last 5 years Adidas had a beta of 1,24, which is quit high and even if we look at a shorter time horizon we still get the same result, because over the last 6 months the company had a beta of 1,25. This means that the Adidas stock is reacting quit high on market movements and that means the stock is more risky than other stocks. Our analysis is not showing a good picture of Adidas. The stagnation in sales and net profit is already an alert sign for many investors because investors want to invest their money in companies that are able to grow in the future. Besides that Adidas also has a very high price-earnings-ratio (24) which shows that the stock might be a little overbought at the moment. We also saw that the main rival Nike is showing some strong growth over the recent years and at the same time Nike as managed to take all top athletes under contract, which is one important difference between Adidas and Nike. The high beta of 1.25 also shows that the stock is more risky for investors because in the case of a stock market correction the Adidas stock could fall even stronger. Due to the current monetary policy of the ECB the European stock market could continue to rise and that means Adidas shares might also continue to go up. However if this happens it is hard to think about a fair stock valuation, as Adidas is already a little overpriced and that means right now Adidas is not a good investment for long-term investors. Of course some corporate news, like quarterly earnings can change the picture again, but right now Adidas is not a lucrative investment.